We must build an economy that supports the needs of regular people and communities, rather than funneling money upward to the super rich. This starts with protecting our rights as workers, by strengthening unions that truly represent members’ needs, and by winning union representation for more workers. Both of my parents are proud union members, and I can guarantee you that I will not give up this fight. We should support small businesses, which keep wealth and employment local, rather than continuing to waste money on tax breaks and giveaways for large corporations. We also need to establish a tax system that makes sense. Right now the top 1% pay far less in PA than in any of our neighboring states.. I support the Fair Share Tax Plan, which would raise $2.5 billion to close the state’s structural deficit and provide additional funding for education. This plan makes sense for our community: it increases taxes on the richest residents and lowers them on almost everyone in South Philadelphia. Fight for a $15 minimum wage and workers’ right to unionize. 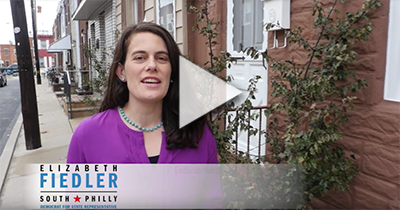 Support the Fair Share Tax Plan, which would increase taxes on the super rich to close the budget gap and lower taxes for most South Philadelphians. Oppose policies that give big tax breaks to the super rich, such as the uniformity clause, and corporate giveaways that never create the jobs they promise. Insist that projects the state invests in create good, family-sustaining jobs, not only in short-term construction work, but also for the long term in fields like service, care, and education.